This cauliflower soup was inspired by one of our recent NY guests who had been accompanying Marie Filice, author of the cookbook Breaking Bread in L’Aquila. 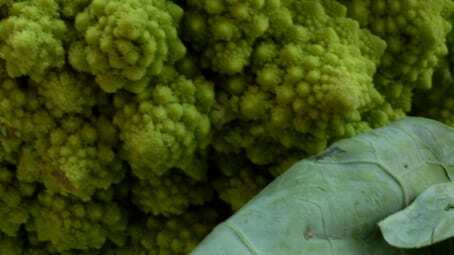 She’d mentioned that she’d seen a lime-coloured cauliflower broccoli up in Bologna, asking if we knew what it was when, low & behold, there it was sitting in our veggie van on its winding route through the Gran Sasso Mountains of Abruzzo, on its bi-daily visit! What Barbara was talking about was Roman Cauliflower, also known as Romanesco Broccoli (Romanesco), which could easily be Nature’s glory piece on the vegetable front, from a design POV at least. Available Sept thru to November, its vivid spiralling florets will charm any lovers of fractals or fans of Fibonacci, the Italian Medieval Mathematican, who explained sequencing – in the Romanesco’s case, how each peaked floret is an identical but smaller version of the whole in its entirety. Not only can this masterpiece give a twirl on the plate, it tastes rather good too, sweeter than regular cauliflower with a hint of nutty broccoli and which mimics the cooking time of broccoli rather than cauliflower – great for those in a rush. Now, one thing I enjoyed back in the UK was cauliflower soup, especially on autumn evenings as a supper dish. I wondered if there was anything similar and came across this Abruzzo thick soupy dish, originally made with broken spaghetti and the more usual widely known cauliflower. I substituted the cauliflower with the Romanesco and Conchetti and it wasn’t too bad! Prepare the vegetable stock by finely chopping the onion, celery sticks, carrot and 1 potato. Fry the onion, celery and bay leaf together for 5 minutes in 1 tablespoon of the olive oil. Add the carrot and potato, a good grind of black pepper and after 5 minutes add 600ml of boiling water and allow to simmer covered for 30 minutes. Chop the garlic clove and with chopped tomatoes & romanesco broken into small florets add to the vegetable broth and bring back up to the boil. (If you prefer squishy florets then cook for another 5 mins). Add the pasta and allow to cook for 5-7 minutes till its al dente. Take off the heat and leave to stand covered for 5 minutes. Drizzle with the remaining tablespoon of oil and serve with olio santo or some peperoncino.